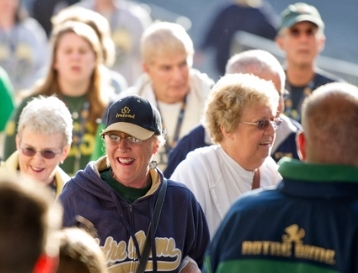 Notre Dame fans thronged Dublin over the weekend . What a fantastic weekend! Tens of thousands of Notre Dame and Navy fans taking advantage of all too rare great summer weather seeing the sights, 'having the craic' in Dublin and, of course, enjoying a football game. The general consensus is that they came, they saw and they were charmed. Oh, and they spent too - an estimated $150m this weekend alone. Of course, they didn't just stay in Dublin a couple of days for the game. They saw the rest of the country too. More spending, more great days for Ireland's hotels, restaurants and pubs. In addition to the sight-seeing and fun times there was some serious business discussion too. The movers and shakers among the traveling thousands were wooed by the government in the hopes that they would steer some investment in Ireland's direction. It was a dream weekend for the Irish economy, one that bears witness to what's possible when Ireland reaches out to accept the two hands always on offer from Irish-America, without which this weekend would never have happened. However, that's as close as official Ireland wants Irish-America to get. Tourists spending a fortune? Hurrah! Wealthy, powerful Irish-Americans steering jobs and investment to Ireland? Hurrah! Any further, deeper involvement of Irish-America in Ireland? "Whoa! Hold on there. That might be an issue. Can't have that." Best example of this is how Craig Barrett has been treated. Barrett was the head of Intel for many years, including when Intel made its initial massive investment in Ireland back in the late 1980s. Back in June of this year Barrett added his name to the list of those Irish-Americans who are willing to sit on boards of state companies, offering their wisdom and experience to these companies, to Ireland, for free. The response of official Ireland to his offer? Zzzzzzzzz. Barrett joined the Irish Technology Leadershp Group's (ITLG) Diaspora 2016 movement after it had already been received in silence by the government and slapped away by Maura Quinn, head of the Institute of Directors (Ireland). Diaspora 2016's mission is to "make a list of at least 100 business leaders from across the globe who wish to contribute their experience and time to helping Ireland's economic recovery." As Barrett pointed out, for Ireland's economy to rebound and thrive Ireland "must integrate the best of Irish innovation from around the world." Too true. There are Irish people, whether born here or of Irish descent, who want to see Ireland succeed. They're willing to help out, to contribute. Spurning their expertise is foolishness in the extrem. As Tom McEnery, former Mayor of San Jose wrote in response to Quinn, "One would think that all is well in Ireland." Attitudes like Quinn's can only be explained as the response of those who are comfortable and fear 'outsiders' coming in and shaking things up. I admire McEnery, Barrett and the others' persistence. They refuse to take 'No' for an answer. There is so much potential in this group, so much that these men and women have to offer. All that's required is that Ireland stop resisting. I just don't see that happening, especially not after this past weekend. This weekend was exactly what official Ireland wants from Irish-Americans. Let's entice them to come to Ireland in big numbers, hence next year's "Gathering." Let's get the very successful among them to come to Ireland, hand them a glass of Jameson and a piece of brown soda-bread, put on a display of Irish dancing, show them our tax breaks and convince them that they should locate their EU operations here. Ask them to bring their non-Irish friends next time. That's the extent of it. That's what Irish-America is for, tourism and investment. I don't really have a problem with either of those, but how is that any different from the strategy in 1987? How does it differ from 1962? Next year's Gathering is actually a good idea. I support it. But how often can we gather? How often can Notre Dame play in Dublin? Networking is the future in a world where technology has made distance almost irrelevant. In Irish-America Ireland has a ready made network; all it has to do is accept it. It's time for official Ireland to reach out with two hands and fully embrace Irish-America.